A newspaper article describing the upcoming graduation of Miss Dora Chatterjee as only the third "Native Hindu" woman to graduate from the college. Commencement invitation and placard belonging to Dr. Anandibai Joshee, the first woman from India to receive a degree in medicine in the United States. "An Event for Hindostan and for Philadelphia, also." / "Distinguished Brahmin Lady in Philadelphia." Newspaper clippings from April 1886 highlighting the arrival of Dr. Anandibai Joshee’s family in Philadelphia for her commencement ceremony. Dr. Joshee was the first woman from India to receive a degree in medicine in the United States. Autograph card signed in English and Marathi by Gopal Vinayak Joshee for Cornelia Kahn, a classmate of Anandibai Joshee at the Woman’s Medical College of Pennsylvania. 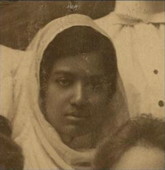 Dr. Joshee was the first woman from India to receive a degree in medicine in the United States.